Aston Villa returned to winning ways in style after romping past Bolton in a bruising encounter at Villa Park. Ashley Young opened the scoring from close range early on before Gabriel Agbonlahor slammed home a second. Johan Elmander tapped in to reduce the deficit but a fine individual goal from John Carew made the game safe. James Milner then slotted home the rebound after missing a penalty and Carlos Cuellar headed his first Villa goal as the hosts totally dominated. Villa fans had not seen their team win since their 2-1 home victory against Chelsea in mid-October and will be grateful to man-of-the-match Carew for inspiring a dominant display. The giant Norwegian striker bullied the Bolton defence all afternoon, and had a hand in everything good from Villa in the final third. 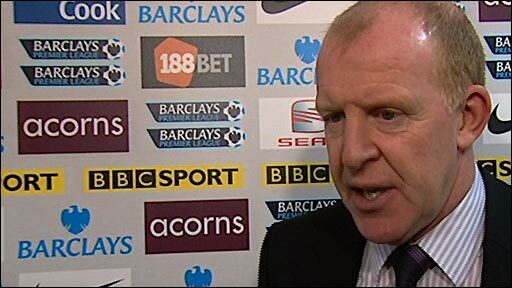 The defeat means Bolton are still without a clean sheet in the Premier League this season and ensures Gary Megson still has a lot of work ahead to unravel his side's serious defensive frailties. The visitors had fielded two ex-Villa players in Gary Cahill and Zat Knight at the heart of their defence, with Cahill publically stating before the game that he intended to prove Martin O'Neill wrong for selling him. But his intentions were not realised, as the sheer power of Carew combined with the pace of Young and Milner caused the visiting defence all sorts of problems throughout the game. The warning signs were there for all to see in the early stages as Villa started the game in ominous fashion - Cuellar forcing Jussi Jaaskelainen into a smart save after only five minutes. It was a superb performance. 4-4-2 can work for Villa. But the visitors failed to learn from their early lapses as Villa moved ahead. Carew out-muscled Cahill and powered a header at goal and although Jaaskelainen saved well low to his left he could only parry the ball into the path of the advancing Young who smashed high into the net. Megson's side did force their way back into the game - in no small part thanks to tireless efforts from Fabrice Muamba in midfield and Kevin Davies in attack. Indeed, the Bolton boss deserved credit for his bold decision to replace midfielder Tamir Cohen with striker Elmander midway through the first half - reverting to a more-attacking 4-4-2 formation. But Cahill's chances of impressing his former boss were all but ended after a monumental blunder on 43 minutes. The centre-half attempted to shepherd the ball out of play but reckoned without the might of Carew, who duly brushed aside his opponent and crossed for Agbonlahor to drive through the legs of Jaaskelainen. Villa were well worth their two-goal lead, but let themselves down by conceding just before the break as Bolton valiantly hit back. A missed header from Cuellar allowed Cahill to shoot on goal. The ball deflected off a diving Richard Dunne and against the post, allowing Elmander to gleefully tap home. It was hardly a goal that epitomised the adventurous style of play Megson had asked for before the match, but the Bolton manager will not have cared a jot. But it was the power of surely the strongest player on the pitch - Carew - that took the game beyond the visitors. Milner, impressive again on the right, slipped the ball into the feet of the Norwegian who had his back to goal and the close attentions of Knight to contend with. But the defender was quickly left on his backside as Carew showed amazing strength in turning, before brushing aside the flagging Cahill and drilling home. That opened the floodgates for the hosts, who quickly moved further ahead. Davies was penalised for a push on Carew in the box, and although Milner's poor spot-kick was saved by Jaaskelainen and the first rebound woefully struck against the post by Steve Sidwell, Milner redeemed himself to finally slot home. The game was already well won by the time Cuellar back-headed his first Villa goal after another teasing cross from Milner, leaving the hapless Bolton defence, and an increasingly under-pressure Megson, with much to ponder. "It's very pleasing. It's great to come to Villa Park. "The crowd are right behind us and we've started to win here which is very important. "We've had a tough run on the road since we last won here against Chelsea. The defeat against West Ham was very difficult to take. "The players were ready, we got out of the blocks quickly and I'm really pleased with the performance." "They haven't had to work hard for the goals they've got. It's not acceptable and nowhere near good enough from our players. "It shouldn't happen. You have to accept that squads like Villa might pass the ball better. But you still have to match them for desire. 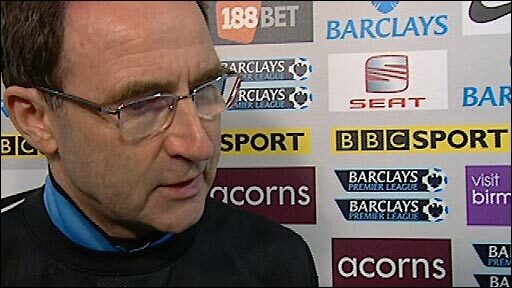 "We've just had a long talk in the dressing room about the desire. People can't expect to be playing like they are. "There's certainly going to have to be some changes as some players are simply not on their game." 90:00+3:09 The referee ends the match. 90:00+2:33 Short corner worked by Ashley Young, The ball is crossed by Fabian Delph, Zat Knight manages to make a clearance. 90:00+1:24 Direct effort from the free kick comes in from Ashley Young, save made by Jussi Jaaskelainen. 90:00+1:24 Booking Caution for Paul Robinson. 90:00+1:21 Foul by Paul Robinson on Nathan Delfouneso, free kick awarded. 89:18 Matthew Taylor takes a shot. Brad Friedel makes a save. 89:12 The ball is crossed by Paul Robinson. 87:43 Booking Craig Gardner receives a caution for unsporting behaviour. 87:21 Free kick awarded for a foul by Craig Gardner on Paul Robinson. Paul Robinson takes the direct free kick. 85:29 Substitution (Aston Villa) makes a substitution, with Fabian Delph coming on for Nigel Reo-Coker. 85:29 Substitution (Aston Villa) makes a substitution, with Craig Gardner coming on for Steve Sidwell. 85:01 Chung-Yong Lee crosses the ball, clearance by Richard Dunne. 84:55 The ball is swung over by Ricardo Gardner. 84:22 Ricardo Gardner takes a shot. Blocked by Carlos Cuellar. 84:15 Paul Robinson produces a cross, save by Brad Friedel. 83:29 Nathan Delfouneso takes a shot. Save made by Jussi Jaaskelainen. 83:05 John Carew fouled by Gary Cahill, the ref awards a free kick. Ashley Young takes the free kick. 82:26 Chung-Yong Lee produces a right-footed shot from just outside the area that goes harmlessly over the bar. 81:13 Substitution Nathan Delfouneso joins the action as a substitute, replacing James Milner. 80:00 Shot by John Carew from outside the box goes over the target. 79:22 Paul Robinson fouled by James Milner, the ref awards a free kick. Free kick taken by Jussi Jaaskelainen. 77:24 Corner from the right by-line taken by Matthew Taylor, Headed effort from deep inside the area by Gary Cahill misses to the left of the goal. 77:18 Chung-Yong Lee produces a cross, Stephen Warnock gets a block in. 76:42 Free kick awarded for an unfair challenge on Paul Robinson by Luke Young. Jussi Jaaskelainen takes the free kick. 74:58 Assist on the goal came from James Milner. 74:58 GOAL - Carlos Cuellar:Aston Villa 5 - 1 Bolton Carlos Cuellar grabs a headed goal from inside the box. Aston Villa 5-1 Bolton. 74:25 Free kick awarded for a foul by Gretar Rafn Steinsson on Gabriel Agbonlahor. Direct free kick taken by Ashley Young. 73:16 John Carew challenges Matthew Taylor unfairly and gives away a free kick. Jussi Jaaskelainen takes the direct free kick. 73:01 Booking The referee shows Kevin Davies a yellow card. 72:29 Chung-Yong Lee produces a right-footed shot from the edge of the area and misses to the left of the goal. 71:30 Steve Sidwell has an effort at goal from deep inside the box hitting the post. 71:18 Assist on the goal came from Steve Sidwell. 71:18 GOAL - James Milner:Aston Villa 4 - 1 Bolton James Milner grabs a goal from deep inside the penalty box to the bottom right corner of the goal. Aston Villa 4-1 Bolton. 69:50 Penalty taken by James Milner saved by Jussi Jaaskelainen. Aston Villa 3-1 Bolton. 69:50 Free kick awarded for an unfair challenge on Ashley Young by Gretar Rafn Steinsson. Free kick crossed by Ashley Young, Kevin Davies concedes a Penalty for a foul on John Carew. 69:14 Gretar Rafn Steinsson produces a cross. 68:12 Substitution Gretar Rafn Steinsson is brought on as a substitute for Samuel Ricketts. 67:14 Centre by Ashley Young. 63:48 The ball is delivered by Luke Young, Steve Sidwell produces a header from inside the area that goes over the crossbar. 63:24 Stephen Warnock delivers the ball. 62:36 Gary Cahill has a headed effort at goal from deep inside the area missing to the left of the target. 61:59 Chung-Yong Lee crosses the ball, Steve Sidwell makes a clearance. 61:23 Free kick awarded for a foul by John Carew on Ricardo Gardner. Free kick crossed right-footed by Zat Knight, Nigel Reo-Coker makes a clearance. 60:44 Unfair challenge on Carlos Cuellar by Kevin Davies results in a free kick. Brad Friedel takes the free kick. 59:06 Foul by Samuel Ricketts on Nigel Reo-Coker, free kick awarded. Stephen Warnock takes the free kick. 58:31 Unfair challenge on Kevin Davies by Steve Sidwell results in a free kick. Jussi Jaaskelainen takes the free kick. 58:20 Ashley Young delivers the ball, clearance by Samuel Ricketts. 57:56 A cross is delivered by James Milner, clearance by Zat Knight. 56:43 Centre by Matthew Taylor, Brad Friedel makes a save. 55:31 Free kick awarded for an unfair challenge on Stephen Warnock by Johan Elmander. Free kick crossed right-footed by Ashley Young from left wing, Samuel Ricketts manages to make a clearance. 54:50 The ball is swung over by Paul Robinson, Gary Cahill takes a shot. Save by Brad Friedel. 53:48 Foul by Samuel Ricketts on Ashley Young, free kick awarded. Richard Dunne takes the free kick. 52:32 Assist by James Milner. 52:32 GOAL - John Carew:Aston Villa 3 - 1 Bolton John Carew scores a goal from close in to the bottom right corner of the goal. Aston Villa 3-1 Bolton. 51:34 The ball is sent over by Ashley Young. 50:56 The ball is swung over by Stephen Warnock, Gary Cahill makes a clearance. 50:37 Gabriel Agbonlahor takes a shot. Zat Knight gets a block in. 50:07 Luke Young takes a shot. Save made by Jussi Jaaskelainen. 50:00 The ball is delivered by Luke Young, clearance made by Fabrice Muamba. 49:31 Kevin Davies takes a shot. Save made by Brad Friedel. 48:09 Ashley Young gives away a free kick for an unfair challenge on Chung-Yong Lee. Matthew Taylor crosses the ball in from the free kick, clearance made by Luke Young. 47:35 Free kick awarded for an unfair challenge on Gabriel Agbonlahor by Samuel Ricketts. Ashley Young delivers the ball from the free kick right-footed from left wing, clearance made by Ricardo Gardner. 47:21 Shot from 25 yards from Fabrice Muamba. Save by Brad Friedel. 47:04 Unfair challenge on Gary Cahill by John Carew results in a free kick. Jussi Jaaskelainen restarts play with the free kick. 45:00+1:02 Brad Friedel takes the direct free kick. 45:00+1:02 Booking Gary Cahill is shown a yellow card for unsporting behaviour. 45:00+0:56 Gary Cahill gives away a free kick for an unfair challenge on John Carew. 44:12 Gary Cahill takes a shot. Carlos Cuellar gets a block in. 44:04 Gary Cahill provided the assist for the goal. 44:04 GOAL - Johan Elmander:Aston Villa 2 - 1 Bolton Johan Elmander finds the net with a goal from inside the six-yard box to the bottom left corner of the goal. Aston Villa 2-1 Bolton. 43:46 Paul Robinson fouled by Gabriel Agbonlahor, the ref awards a free kick. Direct free kick taken by Paul Robinson. 43:08 John Carew challenges Zat Knight unfairly and gives away a free kick. Paul Robinson takes the free kick. 42:02 Assist by John Carew. 42:02 GOAL - Gabriel Agbonlahor:Aston Villa 2 - 0 Bolton Gabriel Agbonlahor finds the back of the net with a goal from inside the penalty area low into the middle of the goal. Aston Villa 2-0 Bolton. 41:25 A cross is delivered by James Milner. 40:45 The ball is swung over by Ashley Young, save by Jussi Jaaskelainen. 40:27 Free kick awarded for an unfair challenge on Carlos Cuellar by Kevin Davies. Direct free kick taken by Richard Dunne. 38:57 Stephen Warnock delivers the ball, Paul Robinson makes a clearance. 35:32 James Milner sends in a cross, John Carew takes a shot. Save by Jussi Jaaskelainen. 33:25 Free kick awarded for an unfair challenge on Gary Cahill by John Carew. Zat Knight restarts play with the free kick. 31:52 The ball is swung over by Samuel Ricketts, clearance by Carlos Cuellar. 31:27 The ball is swung over by Ashley Young, Zat Knight manages to make a clearance. 31:19 Stephen Warnock sends in a cross, clearance by Gary Cahill. 30:40 Ashley Young fouled by Ricardo Gardner, the ref awards a free kick. Direct free kick taken by Richard Dunne. 29:36 Gabriel Agbonlahor has an effort at goal from just outside the box which goes wide of the right-hand post. 28:44 Substitution (Bolton) makes a substitution, with Johan Elmander coming on for Tamir Cohen. 28:03 Ashley Young takes a inswinging corner from the left by-line to the near post, Unfair challenge on Gary Cahill by Richard Dunne results in a free kick. Jussi Jaaskelainen takes the direct free kick. 27:55 Gabriel Agbonlahor delivers the ball, blocked by Zat Knight. 24:32 Ashley Young takes a inswinging corner from the left by-line played to the near post, clearance made by Ricardo Gardner. 23:59 Inswinging corner taken left-footed by Stephen Warnock from the right by-line, clearance by Samuel Ricketts. 23:51 Centre by Stephen Warnock, Zat Knight makes a clearance. 22:52 Booking Tamir Cohen is cautioned by the ref for unsporting behaviour. 21:57 Unfair challenge on James Milner by Tamir Cohen results in a free kick. Direct free kick taken by Brad Friedel. 20:54 Stephen Warnock takes the inswinging corner, Gabriel Agbonlahor takes a shot. Save by Jussi Jaaskelainen. 20:34 James Milner takes a inswinging corner to the near post, Ricardo Gardner manages to make a clearance. 19:45 Paul Robinson concedes a free kick for a foul on Steve Sidwell. Free kick crossed by Ashley Young, clearance made by Ricardo Gardner. 17:54 Shot from deep inside the area by Gabriel Agbonlahor clears the bar. 17:21 Ashley Young fouled by Samuel Ricketts, the ref awards a free kick. Richard Dunne takes the direct free kick. 17:01 James Milner produces a cross, save by Jussi Jaaskelainen. 16:20 The ball is swung over by Ricardo Gardner, Richard Dunne manages to make a clearance. 14:46 Gabriel Agbonlahor is ruled offside. Free kick taken by Jussi Jaaskelainen. 14:01 Luke Young gives away a free kick for an unfair challenge on Matthew Taylor. Free kick taken by Paul Robinson. 12:47 Steve Sidwell sends in a cross. 11:47 The ball is sent over by Samuel Ricketts, Carlos Cuellar makes a clearance. 10:53 Effort from the edge of the area by Ashley Young goes wide of the right-hand upright. 9:14 The assistant referee flags for offside against Gabriel Agbonlahor. Jussi Jaaskelainen takes the indirect free kick. 8:35 Free kick awarded for a foul by Steve Sidwell on Fabrice Muamba. Jussi Jaaskelainen takes the free kick. 7:51 Gary Cahill takes a shot. Save made by Brad Friedel. 7:08 Free kick awarded for an unfair challenge on Tamir Cohen by Steve Sidwell. The ball is delivered by Matthew Taylor, Kevin Davies takes a shot. Carlos Cuellar gets a block in. 6:18 Corner taken by Ashley Young from the left by-line to the near post, John Carew gives away a free kick for an unfair challenge on Zat Knight. Direct free kick taken by Jussi Jaaskelainen. 6:07 The ball is sent over by Stephen Warnock, clearance made by Zat Knight. 4:49 John Carew provided the assist for the goal. 4:49 GOAL - Ashley Young:Aston Villa 1 - 0 Bolton Ashley Young finds the back of the net with a goal from close in to the top right corner of the goal. Aston Villa 1-0 Bolton. 4:41 The ball is sent over by James Milner, John Carew takes a shot. Jussi Jaaskelainen makes a save. 3:33 Corner taken by Ashley Young from the left by-line to the near post, Carlos Cuellar takes a shot. Jussi Jaaskelainen makes a save. 3:25 The ball is swung over by Luke Young, clearance made by Samuel Ricketts. 2:07 The ball is swung over by Gabriel Agbonlahor, save by Jussi Jaaskelainen. 0:56 The ball is crossed by James Milner, Fabrice Muamba makes a clearance. 0:25 Gabriel Agbonlahor gives away a free kick for an unfair challenge on Gary Cahill. Jussi Jaaskelainen takes the direct free kick.